Uyuni, 볼리비아의 피에드라 블랑카 백패커스 호스텔 | 호스텔월드에서 예약하세요. Cancellation the same day or No show: Full payment of the first night. Any change or reduction in numbers until one day before, are free of charge. If it's the same day, full charge will proceed. If you change your arrival time, you have to contact the Hostel as soon as you can. We'll wait for a few hours after the programmed arrival time before cancelling or considering this as a "no show". 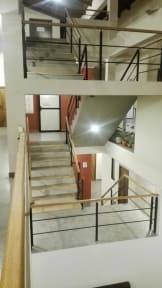 After 7 years working in an adapted place, we are proud of the place we have built. 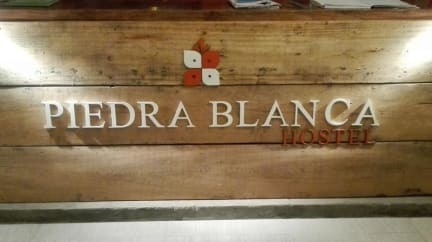 Piedra Blanca Backpackers Hostel is a completely new, one of a kind hostel, designed to fulfill every traveler´s needs. Our building is specially prepared for Uyuni's extreme weather. It's warm and illuminated; it has double walls and windows for insulation and also warm floors and ceilings, along with many different and large spaces that provide you a perfect balance between rest, comfort and recreation. We are sure that now we have a place for you to stop and relax on your journey. Uyuni is a small place; you can walk almost anywhere you want. Our neighborhood is quiet, safe and of easy access. We are located 7 minutes from the center of Uyuni, where you'll find most of the tour agencies, banks and ATMs, pharmacies and hospitals, shops and markets, and pretty much everything you need. We have a beautiful view of Uyuni's landscape, the train storage field and we are just a step away from the train museum. We have comfortable, wide and well equipped private and shared rooms. Central heating for the cold months, hot water 24/7, breakfast included and WIFI, besides 220 m2 of common areas including a full equipped kitchen, a massive dining room, rest and reading living rooms and an outdoor terrace, and not less important, we continue with our extensive cleaning and friendly English-Spanish speaking staff. Our rooms feature: Wooden floors, windows, night tables, safe box, table and chairs, dresser with mirror, hangers. Fleece or cotton sheets, special warm and light covers. Really clean and cozy. If you change your arrival time, you have to contact the Hostel as soon as you can. We'll wait only for a few hours after the programmed arrival time before cancelling or considering this as a no show. Towels included for private rooms only. Towels to hire for shared dorms. 위치는 시내에서 도보 15분정도 걸린다. 이것만 빼면 아주 완벽. 조식도 나쁘지 않고 따뜻한 물도 잘 나오고. 굉장히 깔끔해 보인다 숙소 자체가. 한국 분들도 많이 계셔서 동행 찾기에도 쉬울 듯!! 숙소 자체는 상당히 만족스러웠습니다. 분위기부터 보안, 침구류 상태 나무랄 것이 하나도 없더군요. 다만 한국인들이 모이는 투어사와 거리가 상당해서 투어다녀와서 숙소까지 힘들 수 있습니다. 친구들이랑 얘기하면서 왕복해서 그럭저럭 갈만은 했습니다만 거리가 멀다는 건 부정할 수 없는 사실입니다. 우유니에서 4박동안 묶었던 숙소입니다. 24 시간 슈퍼 핫 샤워 가능하고, 수압도 좋고 진짜 최고! 호스텔도 전반적으로 따뜻한 분위기입니다! (8월 기준으로 방에서 반팔 입고 생활했어요. ) 스텝들도 넘 친절하고 좋았어요. 주방도 크고 깔끔해서 요리 해먹기도 아주 좋아요! 아 그리고 이것 저것 지킬거 많다고 하는데 진짜 기본적인 것들이라 지내는 동안 문제 없었습니다. 중심지에서 거리 멀다고 하는데 10분 정도면 충분히 가능하구요, 아침 일찍 시작하는 선라이즈, 늦게 끝나는 스타라이트 투어 같은 경우에는 거의 다 드롭오프 서비스 있어서 크게 불편한 점 없었어요! 다시 우유니에 간다면 여기에 묶을 것 같아요. 진짜 100% 추천하는 숙소입니다! 와이파이 잘 된다고 한국 사람들 많이들 가시지만 완전 비추합니다. 여기 가격도 좀 쎈편이라 차라리 투어사 근처 저렴한 호스텔의 개인실을 쓰는게 낫다고 생각되어요. 여긴 위치가 중심가나 투어사에서 너어어어어어무 멀어요 이 거리 별거 아니라고 생각하겠지만 진짜 최악입니다. 그리고 외지구요. 그리고 직원들이 너무 깐깐하고 정책이라고 미리 말해주지만 하나하나 벌금처럼 책정해두고 그대로 다 받는게 충격적이다 체크아웃 후 투어 갔다와서 샤워하는게 20볼+타월 대여비는 2볼이다. 어느정도 받는건 이해하지만 물가에 비하면 너무 비싸다는 생각이 드네요. 여기 말고 투어사 근처에 다양한 숙소들을 우선 찾아보길 추천합니다.